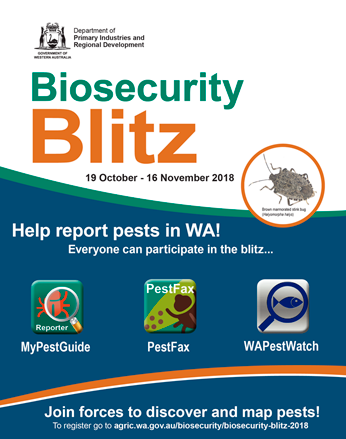 All you have to do to contribute to the Biosecurity Blitz 2018 is download one of our pest reporting apps and get out there and make pest reports. But which app should you use? Here is a quick summary of the main differences between them. MyPestGuide Reporter allows users to send reports of any organism to DPIRD and include location information, descriptive text and up to 4 photos. Users can choose to include their observation on the community map. Once a report is received, a DPIRD expert identifies the pest. A response is sent back to your device and via email. Individual reports can be viewed by the whole community to share what you see without sharing any personal information. The app is suitable for reporting a wide range of organisms so it's your best bet if you're not sure which app to use! PestFax Reporter was developed for broadacre agronomists and naturalists who are confident at identifying pests and require a quick app to make repeated reports such as when crop scouting. This app is recommended for reporting crop and pasture pests, diseases, weeds or other damage like frost directly from the paddock. If you're already using it then definitely keep using it for the blitz! WA PestWatch was developed to help detect aquatic pests. The app lets users take and send photos to DPIRD, adds your observation to a community map and emails you an immediate response. Once a report is received, DPIRD staff will review it and contact you if further information is needed. To help the WA PestWatch team to back to you faster, please include your phone number in the comments section of your pest report. Don’t worry if the pin for your report doesn’t change colour – this just means we haven’t been able to verify yet whether you've found a pest or not.